Heat oven to 325°F. In heavy 1-quart saucepan, mix topping ingredients. Heat to boiling over medium heat. Cover; boil 1 minute. Uncover; cook until sugar becomes golden brown. DO NOT STIR. Very carefully pour and swirl sugar into 6 (6-oz) custard cups. In 2-quart saucepan, mix 1/2 cup milk, the sugar, cocoa and cinnamon. Heat to boiling over medium-high heat, stirring constantly with wire whisk. Continue to boil 1 minute, stirring constantly. Remove from heat. Using wire whisk, beat in evaporated milk, vanilla and eggs. Pour mixture evenly over sugar in custard cups. Place custard cups in 13x9-inch (3-quart) glass baking dish. Place baking dish on center oven rack. Pour hot water into baking dish until it is halfway up sides of custard cups. Bake 50 to 55 minutes or until knife inserted near edge of custard mixture comes out clean. Carefully remove cups from water; cool slightly, about 5 minutes. Refrigerate until well chilled, about 50 minutes. 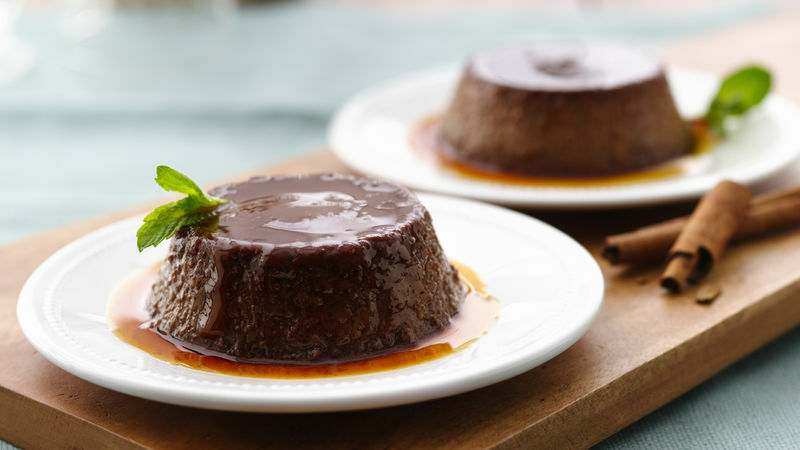 To serve, unmold flans onto individual dessert plates. If desired, top each with chocolate shavings. Cover and refrigerate any remaining flans. To unmold flans, pour hot water into 13x9-inch pan. Place flans in water 1 to 2 minutes. Loosen edges with a spatula; turn upside down onto serving plates. Custard mixtures like this one are always cooked with water surrounding them because they need gentle heat to keep from curdling.